Including a peek into her purse-slash-lunchbox. Today, NCIS: New Orleans star Shalita Grant visited the HealthÂ office, and theÂ 27-year-old talked to fitness editor Rozalynn FrazierÂ aboutÂ how she stays fit and healthy while shooting the show, which can keep her on set for up to 14 hours a day. We live-streamed the chat on Facebook, which you can check outÂ below. Watch Grant demonstrate some of the moves from her on-set workouts (clapping pushupsÂ are involved, OMG), explain how she maintains her motivation, and dish on her all-time favorite fitness class. 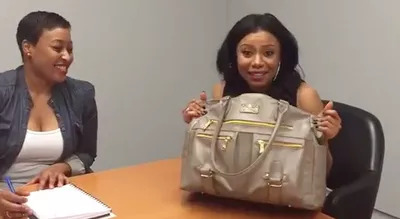 Grant also showed us her bag, which Facebook commenters were going ga-ga overÂ during the live stream.Â "Doesn't this look expensive, like it's designer?" she said. "It's a lunch box! In this lunch box there's prep for four meals." Eating the catered food on set would derail her diet, she explained, so she packs all her meals in theÂ 6-Pack Fitness Renee tote ($170; amazon.com), which has zippered compartments that hold four included plastic food containers. The purse-slash-lunchbox also has room forÂ a laptop and has dedicated pockets for your wallet, keys, and phone. Hi everyone! Shalita Grant from NCIS New Orleans is here with our fitness editor Roz sharing all her workout and healthy eating secrets!